The Roar of the Greasepaint – The Smell of the Crowd is a musical with a book, music, and lyrics by Leslie Bricusse and Anthony Newley. The musical is best known for introducing the standards "Who Can I Turn To?" "Feeling Good" and "The Joker" the last of which was covered most successfully by Bobby Rydell. The show title is a transposition of the phrase "the smell of the greasepaint, the roar of the crowd," referring to the experience of theatre performers. 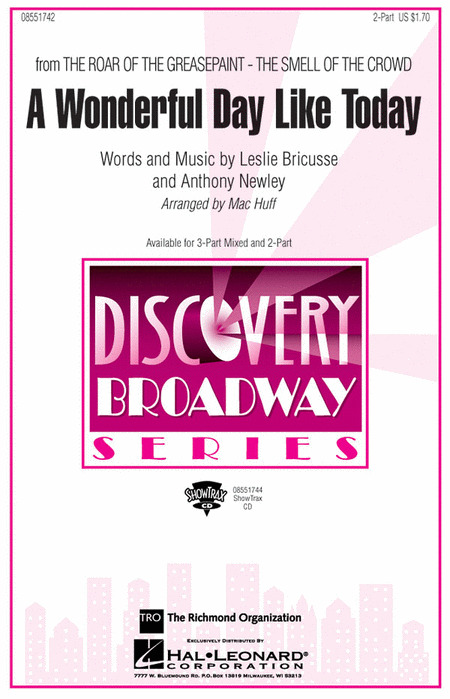 18 vocal selections from the Anthony Newley and Leslie Bricusse favorite, including: The Beautiful Land - Feeling Good - Look at That Face - My Way - Nothing Can Stop Me Now! - Sweet Beginning - This Dream - Where Would You Be Without Me? - A Wonderful Day like Today - and more. Mac Huff : Nothing Can Stop Me Now! This Broadway standard kicks into high gear and never lets up. Mac Huff has arranged this piece to showcase your choir as they sing of their bright futures using driving rhythms and building dynamics. Use the ShowTrax CD for an authentic Broadway sound or the Instrumental Pak for your favorite pit orchestra. Available: SATB, SAB, 2-Part, Instrumental Pak, ShowTrax CD. Performance Time: Approx. 2:45.